Here's another band I had thought dropped off the face of the heavy metal map, Germany's Sinbreed. 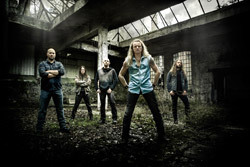 But they're back after a four year hiatus with their second album Shadows, now with AFM Records. And Shadows is rather raging and intense from start to finish. I actually had to listen to a few songs from their previous album, When Worlds Collide (2010), because I wasn't sure if I was listening to the same band. Call it the same, but different or perhaps a logical progression. Shadows takes the power metal of that previous album and jacks it up with the steroids of additional speed and blistering riffage. It moves like the Flash trying to keep up with Superman in a ground race around the Equator. Unfortunately, the melody and groove get a beat down within every song. It's not that they're not there, it's simply that they're pounded into submission by the combination of breakneck speed and punishing riffage. Most of the melody comes in the form of founding member Flo Laurin's guitar solos. (It's not clear how much Blind Guardian's Marcus Siepen contributes to these.) The result with one spin through is that you'll find the metal here relentless, unvarying, and eventually almost redundant. These were not characteristics of the previous album. That album had variation, even more creativity. Honestly, except for listening a second time to write this review, I was done with Shadows the first time around, finding it nearly wearisome in the end. Your experience may be different. 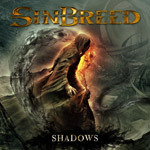 Sinbreed's Shadows is relentless crushing bullet train speedy power metal, decimating melody and groove along the way.